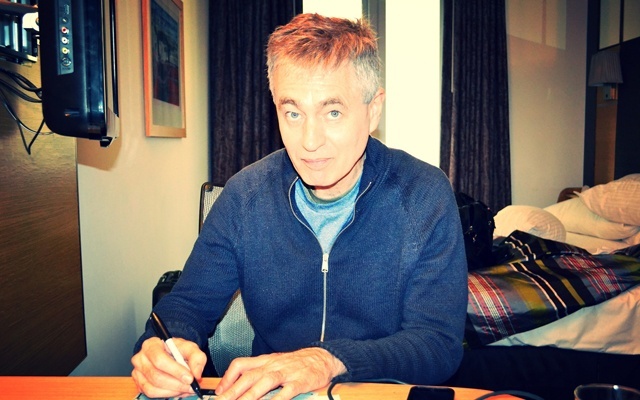 The Chicago-based documentary filmmaker Steve James ("Hoop Dreams", "The Interrupters") is the sole guest on this episode of the podcast. Steve has a new film coming out Friday, July 4th on the life and career of the late film critic Roger Ebert, called "Life Itself". James opens up about his own life and growing up in Virginia and how ended up moving to the mid-west and becoming a filmmaker. Roger Ebert, who collaborated on the film in his final months, was an early advocate of Hoop Dreams at a time when there was very little traction for a documentary about poor black high school basketball players. Subsequently, the themes of economics and race would return through many more of James' films. "Life Itself" (the title comes from Ebert's memoir) is the the latest in a long series of collaborations Steve has had with the production company Kartemquin Films. Kartemquin is also involved in a Kickstarter campaign to raise financing for a new project called "Almost There: A Coming of (Old) Age Story". Check out this unique project and consider contributing. This episode of the podcast is dedicated to the memory of the great filmmaker Paul Mazursky ("Harry & Tonto", "Moscow on the Hudson") who recently passed away at the age of 84.